A long rectangular, round-ended, stretch of water first depicted on Jan Kip’s engraving of Wanstead Park in the early 1700s. 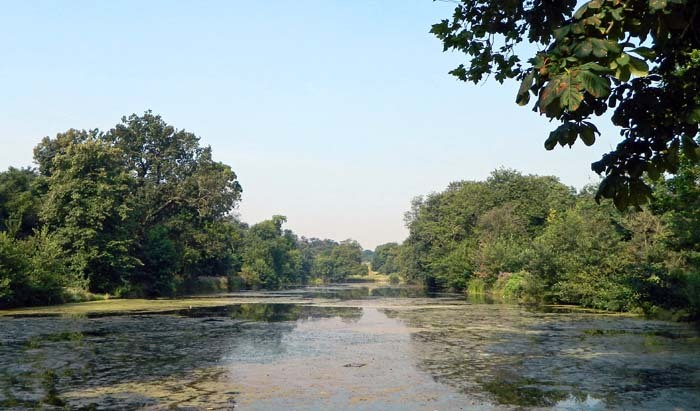 Its origins are unclear: it may be one of the ponds created by Sir Josiah Child, or it may be part of the improvements made by his son in the earlier phase of the landscaping work he commissioned before 1712. Kip shows the Straight Canal with tree-lined avenues to both sides, and forming the eastern end of the eastward vista from Wanstead House. By 1725 Cradock’s map shows the canal incorporated into the Ornamental Water, with a rounded west end and a squared-off east end. The avenues of trees survive to the north and south, but it is shown surrounded by a second canal with a formally shaped east end. This 'outer canal' appears to be fed by channels cut from the River Roding. By Searles' plan of 1779, a new canalised course of the River Roding had been constructed and most of the outer canal was abandoned, though remnants are clearly visible to this day as large dry hollows on the northern and southern sides, and to the northeast as a section of the present course of the River Roding.